Image Capture is one of OS X’s best kept secrets. This photo-savvy program, which lives in your Applications folder, may not have iPhoto’s beautiful interface, nor its vast feature set. But it does a great job of grabbing a quick shot and performing complex actions without having to first add the images to iPhoto’s library. And in Snow Leopard, Apple completely overhauled Image Capture to make it even more useful. Once you fire up the application, you can connect anything from an iPhone to a Canon 5D Mark II, browse images on the memory card, then download only the ones you want. You can have multiple devices connected at once and choose among them, and even share their images with others on your network. If you haven’t taken a look at Image Capture lately, here are some of the time-saving tricks you’re missing out on. If you’ve been terrorized by iPhoto launching every time you plug in your digital camera or iPhone, you can fix the problem with a few clicks in Image Capture. Launch Image Capture, connect your device, and make sure it is highlighted in the left column. Now choose what you want to have happen from the popup menu at the bottom of the column. 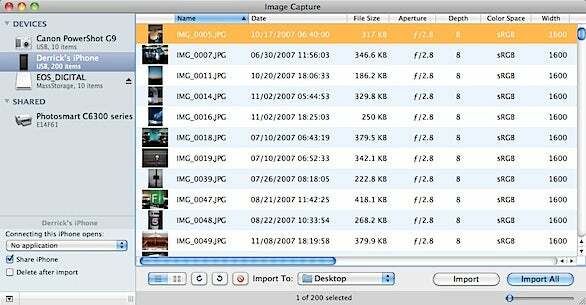 Image capture will list all of the available photo programs; selecting one will set it as the default application for the camera. This means the program will launch when you plug in the device. You can also choose to have nothing happen when the camera is plugged in. What’s even cooler is that you can set different actions for different devices. If you want iPhoto to launch when you connect your compact camera, for example, but don’t want anything to pop up when you plug in your iPhone, Image Capture will take care of it. In the latest version of Image Capture, you can set different default applications for each camera, iPhone, or compatible device. Connect your camera or card reader and launch Image Capture, if it’s not already open. You’ll see thumbnails of all the images on your camera. Click on the shot you want, use the Import To pop-up menu to specify where you want it saved, and then click on the Import button. (Don’t be tempted by the glowing, blue Import All button; that downloads the entire camera roll.) You’ll get the full-resolution photo—along with any metadata and GPS coordinates—in the destination you chose. If you want multiple images, Command-click on the ones you want and choose Import. This is also for a great way to download your iPhone videos, which appear alongside the still photos in Image Capture. If all you want to do is e-mail a photo or two, here’s an even quicker option. Just connect your device to Image Capture, click once on the thumbnail of the photo you want to send, choose Mail from the Import To pop-up menu, and then click the Import button. You will be greeted with an e-mail message ready to send with the photo attached. By default you’ll get a full-resolution photo as your attachment, which many recipients may not want. To slim it down, just choose Small or Medium from the Image Size pop-up menu in the lower-right corner of your message. Mail will downsample the photo to a more palatable size. Then all you have to do is address your e-mail and click on Send. Having trouble finding the shot you want? 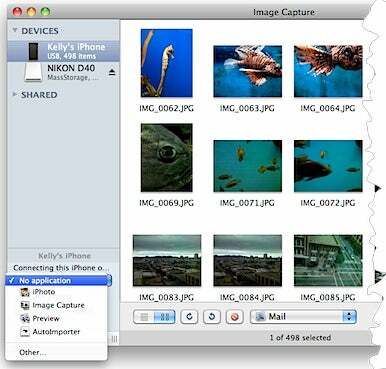 Image Capture lets you change how you sort the images on your device. To access this feature, click on the List View icon at the bottom of the Image Capture window. You’ll now have access to a whopping 17 columns of data, including Name, Date, File Size, Aperture, Shutter Speed, ISO, and Focal Length. Click on any of these columns to organize your pictures by that criterion. Click a second time to reverse the order. Once you’ve sorted your photos the way you want, you can switch back to icon view; your pictures will retain the order. This is useful, for example, if you’ve used the same memory card in different cameras and want to find the photos from a specific camera. I also use this trick to sort pictures by ISO. For the pictures taken with my iPhone 3GS, the ISO can range from 70 to 1016. Since a lower ISO generally results in a better image, this sorting method helps me decide which image to send to the printer. In its early days, Image Capture served as your flatbed scanning interface. But over the years that functionality rarely performed as expected, if at all. Snow Leopard has changed that. 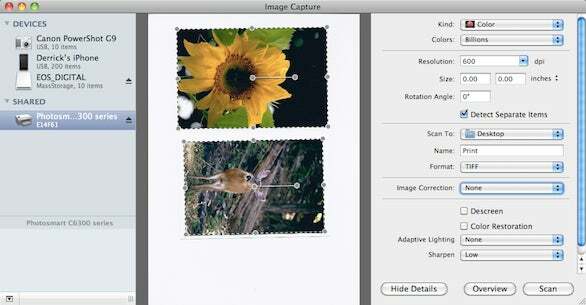 In OS X 10.6, Image Capture will let you control a compatible scanner—even if it’s not attached directly to your Mac. For example, I was able to control my HP Photosmart C6380 and C8100 multifunction printers with no problem over my Wi-Fi network (the devices offer built-in Wi-Fi support). If you’re connecting over a network, the scanner will appear under the Shared item in the left-hand column. To start a scan, click on the device’s name. Once the connection is made, you’ll see a message that reads: Press Scan To Start. You can then place a couple snapshots on the flatbed surface. Image Capture works with the scanner software to detect separate images when scanning. Simply check the box next to the Detect Separate Items option and then press Scan. When the scanner is finished, you’ll get a preview of your snapshots, each outlined with a border. If you’d like to refine your scanner settings—including resolution, color, size, rotation, and file format—click on the Show Details button (see “Savvy Scanning”). You can even apply image correction and sharpening. Once the scan is complete, you’ll end up with individual files for each snapshot. If you have multiple Macs running Snow Leopard on your network, you can give each of them access to a camera or memory card attached to your Mac. This is handy, for example, if you have your iPhone connected to your desktop system, but you want to copy some of its pictures to your laptop. It can also be a boon in work situation where several people need access to the same images. To share your images over the network, connect your iPhone, card reader, or compatible digital camera to your Mac, open Image Capture, and then turn on the Share Camera option at the bottom of the left-hand column (if you don’t see it, click on the small upward arrow). Next, go to another Mac on the network, open Image Capture, and your device should appear under the Shared heading. You can then browse thumbnails and download any full size image you want. As each picture is downloaded, Image Capture will apply a green checkmark to the corner of the thumbnail. Unfortunately, it doesn’t appear that you can access shared files from previous versions of Image Capture; everyone must be using Snow Leopard. Turn on the Share option at the bottom of the Devices list to broadcast your photos over the local network. Shared devices show up under the Shared heading (here, you can see my wireless HP MFP). Want a quick contact sheet of the birthday photos you just shot? With Image Capture and OS X 10.6, you don’t even have to download the images first. Once your device is connected and you can see thumbnails, select the images you want to include on the contact sheet, choose MakePDF from the Import To popup menu, and then click on Import. 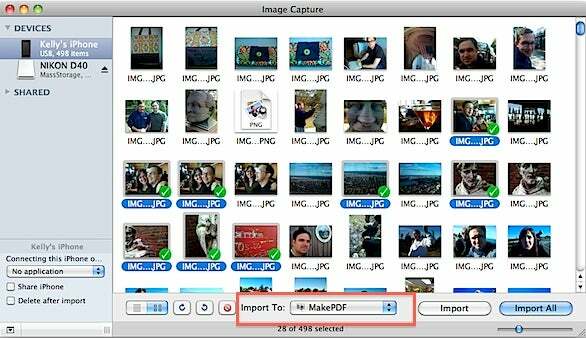 Image Capture will initiate the process then hand over the work to the MakePDF application. Use the Import To menu to send selected photo to other apps, including the MakePDF app. Once images are processed, you'll see a checkmark next to its icon. Once the contact sheet is created, use the Save command to preserve the layout as a PDF. however, this isn’t just any old contact sheet. Open it in Preview and you’ll see that the resulting PDF will contain small, but high-resolution thumbnails of your photos; each image remains sharp even as you zoom in. This means the viewers can get up close to see all of the image’s details. If you have a few touchups you’d like to perform on a photo before e-mailing it off, there’s no need to switch to a full-fledge image-editing app. Instead, choose Preview from the Import To popup menu and then click on Import. Your photo will quickly open in Preview where you can crop, adjust tone and color, and even sharpen via the Adjust Color palette (Tools -> Adjust Color). When you’re done, simply attach the photo to an e-mail message and send it off.